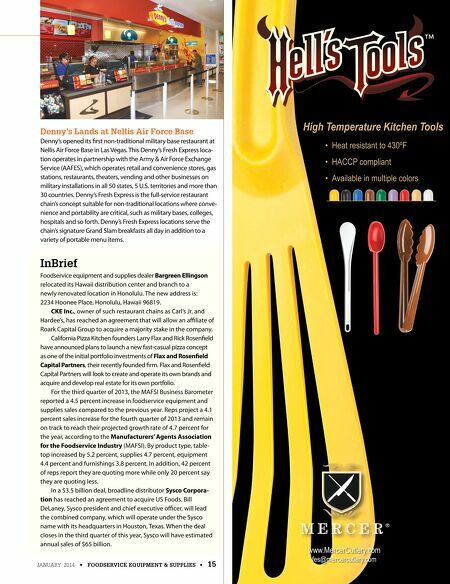 JANUARY 2014 • FOODSERVICE EQUIPMENT & SUPPLIES • 15 High Temperature Kitchen Tools www.MercerCutlery.com fes@mercercutlery.com • Heat resistant to 430ºF • HACCP compliant • Available in multiple colors InBrief Foodservice equipment and supplies dealer Bargreen Ellingson relocated its Hawaii distribution center and branch to a newly renovated location in Honolulu. The new address is: 2234 Hoonee Place, Honolulu, Hawaii 96819. CKE Inc., owner of such restaurant chains as Carl's Jr. and Hardee's, has reached an agreement that will allow an afliate of Roark Capital Group to acquire a majority stake in the company. California Pizza Kitchen founders Larry Flax and Rick Rosenfeld have announced plans to launch a new fast-casual pizza concept as one of the initial portfolio investments of Flax and Rosenfeld Capital Partners, their recently founded frm. Flax and Rosenfeld Capital Partners will look to create and operate its own brands and acquire and develop real estate for its own portfolio. 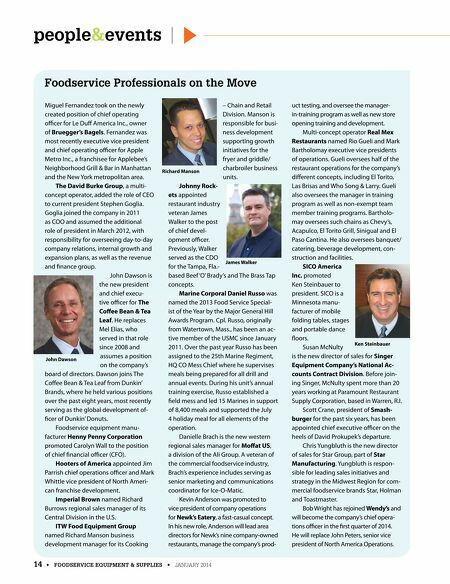 For the third quarter of 2013, the MAFSI Business Barometer reported a 4.5 percent increase in foodservice equipment and supplies sales compared to the previous year. Reps project a 4.1 percent sales increase for the fourth quarter of 2013 and remain on track to reach their projected growth rate of 4.7 percent for the year, according to the Manufacturers' Agents Association for the Foodservice Industry (MAFSI). By product type, table- top increased by 5.2 percent, supplies 4.7 percent, equipment 4.4 percent and furnishings 3.8 percent. In addition, 42 percent of reps report they are quoting more while only 20 percent say they are quoting less. In a $3.5 billion deal, broadline distributor Sysco Corpora- tion has reached an agreement to acquire US Foods. Bill DeLaney, Sysco president and chief executive ofcer, will lead the combined company, which will operate under the Sysco name with its headquarters in Houston, Texas. When the deal closes in the third quarter of this year, Sysco will have estimated annual sales of $65 billion. Denny's Lands at Nellis Air Force Base Denny's opened its frst non-traditional military base restaurant at Nellis Air Force Base in Las Vegas. This Denny's Fresh Express loca- tion operates in partnership with the Army & Air Force Exchange Service (AAFES), which operates retail and convenience stores, gas stations, restaurants, theaters, vending and other businesses on military installations in all 50 states, 5 U.S. territories and more than 30 countries. Denny's Fresh Express is the full-service restaurant chain's concept suitable for non-traditional locations where conve- nience and portability are critical, such as military bases, colleges, hospitals and so forth. Denny's Fresh Express locations serve the chain's signature Grand Slam breakfasts all day in addition to a variety of portable menu items.